The election showed that socialism is popular and tens of thousands of people have drawn the conclusion that it's time to get organised to fight for their future, writes Sarah Sachs-Eldridge, Socialist Party national organiser. 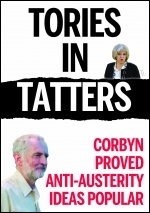 The general election was a choice for those opposed to Tory austerity, writes By Peter Taaffe general secretary Socialist Party. Amid the trumpeting about a massive vote for the party of the new president, Emmanuel Macron, in the first round of France's parliamentary election on 11 June, a deep malaise pervades French society, writes Clare Doyle, Committee for a Workers' International. Socialist Party members visited the picket lines at Sierra Glass in Paignton on 5 June and showed the strikers the previous report in the Socialist, writes Alex Moore and Sean Brogan, Torbay and Exeter Socialist Party. Tories out! Corbyn in! Take the wealth off the 1%! : While working class people across Britain go hungry, directors of massive corporations continue to rake in obscene bonuses, writes Geraint Thomas, Nottingham Socialist party. The average low-waged worker gives nearly half of every day's pay straight to private landlords, housing charity Shelter's new statistics have revealed, writes Laurel Fogarty. Want a pay rise? Join a union. That's the message from recently published government data showing that being in a trade union increases pay for the majority of workers, writes Tessa Warrington, PCS union rep.
For the first time in the eight years that I have been a representative and activist with the Communication Workers Union (CWU), there is a Labour leader who is unapologetic in his support of trade unionism, writes Carl Harper, CWU shop steward (personal capacity). Up to 800 delegates met in Plymouth from 4-6 June for the 100th congress of the general union GMB, writes Kim Hendry, GMB union PCS branch and GMB conference delegate (personal capacity). For a real cross-community socialist alternative: Theresa May's humiliating failure to win a parliamentary majority has placed the Democratic Unionist Party (DUP) at the centre of UK politics, with the party set to prop up the Tories through a 'confidence and supply' agreement, writes Daniel Waldron, Socialist Party Northern Ireland (CWI Ireland). "Tory cuts, austerity and deregulation will have played a key part." Amid the righteous grief, anger and calls for a criminal investigation, Guardian writer Simon Jenkin, not usually a friend of Militant Liverpool, today in a searing piece attacking the architects of the disaster, made a significant observation. 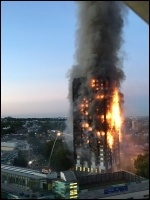 Tories and May stagger on amid crisis - get them out! "I've not seen anything quite like the march"
Kick out the Tories to save the NHS! Unison conference: "A sense of change"
"Austerity hurts and the only alternative is socialism"
Protests around the country demand: Tories out! "It was encouraging to see confident, young people stand up and put forward their ideas for how we could shape a movement"
There was a real carnival atmosphere not just because it was Pride - but as one person said: "It's like a weight of nasty politics is off my shoulders"
The 'sweeping victory' for La République En Marche! (REM) - party of neoliberal president Emmanuel Macron - in the second round of parliamentary elections on 18 June, is not the resounding victory it might appear. Why I joined the Socialist Party: I am an NHS nurse and have been for over 37 years, writes Tom Hunt, Mansfield Socialist Party. "Well I have finished it! I have completed reading the marvellous book From Militant to the Socialist Party. What an absolutely brilliant read, remembering some of the events I was involved in, writes Jimmy Haddow. On 25 July 40 people gathered in the village hall in Pentrich, Derbyshire, to mark the 200th anniversary of the Pentrich Rebellion (see socialistparty.org.uk for more), writes Karen Seymour, Mansfield Socialist Party. "What do we want? Pay parity. Between 1979 and 1983 the Tories slashed £120 million from Liverpool's budget - how did the Militant-led socialist city council fight back? 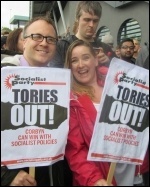 The Daily Mail ran a piece on Socialist Party London organiser Paul Callanan - "the lowest of the low"
Students 'skirt' school uniform issue!